The ground floor living space with marble floor from Lapicida. This remarkable Wesleyan chapel took four years to convert and left design enthusiast Mark Hinchliffe physically and mentally exhausted. 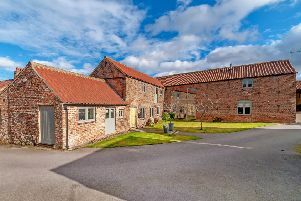 In a recent Yorkshire Post magazine feature on the property, he admitted he had been “to hell and back” when turning the 7,000 sq ft Italianate building into a luxury live-work des res, but as all serial renovators know, the pain is quickly forgotten and you soon find yourself dreaming of a new project. That’s why Mark is exploring the option of selling, while stressing that he is equally happy to live in the former chapel and run it as a boutique B&B. He bought the chapel in 2013 and came up with a design that preserved its most impressive features. The stained-glass windows have been restored, the pulpit has a starring role and the 50ft high amphitheatre-style heart of the building remains. Mark’s collection of art, antiquarian books and vintage curios also play an important part in its new look, along with a specially commissioned two-metre-wide chandelier made by avant-garde designer Mark Brazier-Jones. The property has a portico, reception hall, drawing room, gentlemen’s club room and ladies’ boudoir that could be converted into reception rooms, a breakfast kitchen with cabinets made from recycled pews, an orangery, dining room, library, utility room, plant room, two WCs, a master bedroom with en-suite and balcony and five further bedrooms all with en-suites. Outside, there is a garden and off-street parking. All the bathrooms have electric underfloor heating, the drawing room and kitchen have a wet underfloor heating system fuelled by a biomass boiler. The property also benefits from an Envirovent heat recovery system and a state-of-the-art security system with CCTV cameras that can be managed from mobile devices. The conversion and its contents have impressed architect and TV presenter George Clarke and the chapel is due to feature on Channel 4’s Restoration Man shortly. One of the bathrooms with restored stained glass window.